Done with my first 16K run! - the New Balance Power Run 2013 at BGC, Taguig. No official results yet but I crossed the finish line in about 1hour 59minutes. I will tell more about that race in my next post, but for now, I want to share an article by Matt Fitzgerald of www.active.com on what to do after the race. Every finish line is also a start line—for recovery, that is, and for your preparations for the next race. What you do in the minutes, hours, and days after completing any race will determine just how quickly you get your legs back and return to regular training. Doing the rights things will make racing minimally disruptive to your overall training program, whereas doing the wrong things could spoil your next race by setting back your training or even by resulting in illness or injury. So, just what are the right things? Let's take a look. Your first order of business after turning in your timing chip and shaking the hand of the person you beat in a sprint finish is a proper cool-down. Jogging slowly or walking and stretching after finishing a race will flush lactic acid and other metabolic wastes from your muscles and jump-start the muscle repair process. For races up to the half marathon distance, jogging is preferable, except if you're a slower runner for whom there's no real difference between race pace and cool-down pace. Go for 10 to 20 minutes, depending on your fitness level and state of fatigue, and then stretch all the muscles of your lower body for several minutes. Try to stay on your feet for another half hour or so after you complete your cool-down. After a marathon, cool down with walking and stretching. Your next concern is getting the right nutrients into your body in the right amounts. You need water and electrolytes to replace fluid losses, carbohydrate to replenish depleted stores of muscle and liver glycogen, and protein to repair damaged muscle cells. Try to consume at least 16 to 24 ounces of fluid in the first hour, plus one gram of carbohydrate for every pound of bodyweight, and about one gram of protein for every four grams of carbohydrate. The most convenient way to get all this stuff is in the form of a sports drink formulated especially for recovery. One thing to avoid is getting a massage right after the race, unless it's a very light one. Anything more than a gentle, superficial rubdown could actually increase the inflammation and muscle tissue breakdown you've incurred through the race and from which you now must recover. The best time for a proper sports massage is 24 to 48 hours after the race. Two things you should try to avoid for the remainder of rest day are extended periods of sitting and alcohol consumption. While it's tempting to tipple in celebration of a race well run, this is the worst possible time to do so, as alcohol interferes with the rehydration process. If you must travel after your race, make frequent walk-and-stretch stops if you're going by car or pace the cabin of your plane every 20 minutes or so. It's important that you continue to take in proper nutrition for recovery through the first 24 hours after you've crossed the finish line. Your glycogen stores are severely compromised after racing and must be restored before you can return to normal training. During this period you should take in enough carbohydrate to equal a total intake of about 3 to 5 grams for every pound of your bodyweight. Unless you're a high-mileage runner, don't do any running the day after a race. There is no fitness to be gained, and much recovery to be lost, in forcing yourself to stagger through even a short training run within 24 to 30 hours of racing at any distance. Just walk and stretch for circulation. 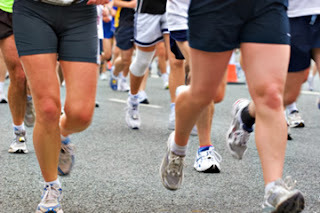 If you've run a marathon, don't run for at least three days, no matter who you are. How quickly you return to normal training depends on the length of the race you've just completed, your fitness level, and when you plan to race next. If the race you've just completed is the last one in your current training cycle, you should feel no rush to return to normal training. In fact, you'll be better served in the long run if you allow your body and mind to rejuvenate through a brief span of inactivity followed by a period of informal, just-for-kicks workouts, perhaps featuring some alternative modes of exercise. Having said that, however, we do recommend that you have some idea as to what your next running goal will be even before your climactic race, as this will help you overcome the post-peak blues runners normal feel following a much-anticipated race, whether they've raced well or poorly. After shorter races, up to 10K, you can do your next hard run within as few as three days, if you're a high-mileage runner. Otherwise, wait about five days. After a 10-miler or half marathon, fitter runners can go long or fast again after four or five days, while more casual runners should wait at least a full week. And after a full marathon, all runners wishing to maintain a high level of fitness should do little or no running for four to seven days followed by a week of only low-intensity running. Then you can return to your normal regimen. Cross-training is a great way to maintain fitness without slowing the recovery process in the first few days after a longer race. Walking, swimming, cycling and inline skating are all good choices, as long as you keep the intensity low. Remember, replenishing glycogen stores is as important to the recovery process as overcoming muscle soreness, and high-intensity exercise performed in any mode too soon after racing will retard it. Unless your next race is your "retirement" race, you'll want to execute a proper recovery plan afterward. By following the guidelines I've provided here, you can accelerate your body's return to homeostasis and get a jump-start on your preparations for the next race.